The string of cold, overcast DSLR photography lessons continued yet again for Linda's third lesson in as many weekends. 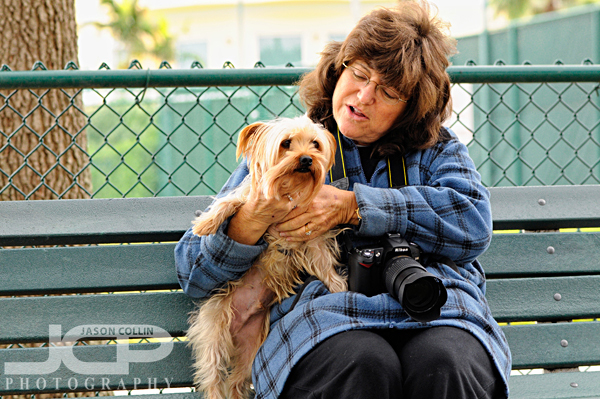 For this lesson Linda brought along Benji, her Yorkshire Terrier to be her practice model. She wanted to learn how to photograph Benji in action. We went to North Shore Dog Park in the old northeast section of Saint Petersburg. Since there was no sunshine at all that morning we really had to pay close attention to maintaining a fast enough minimum shutter speed in order to keep Benji looking sharp. So just like in Carmen's lesson the day before, I again advised a student to use the auto-ISO feature. We set the max ISO to 1600 and the minimum shutter speed to 1/500th of a second as Benji was a quick little guy when he wanted to be. 4 month old pug puppy, Beatrice, always warmly greeted Linda when she knelt down. We were not alone in the small dog section of the North Shore Dog park. Other sub-20 pound dogs were running about including fawn pug Beatrice who never failed to come over and nuzzle and give kisses to anyone she could reach. She was a very cuddly and sweet puppy. Linda and I ended the DSLR photography lesson by practicing landscape shots with her new tripod. The overcast skies did not provide for any stunning views of Tampa Bay, but at least we could practice what settings to use and Linda wisely wrote them down into her notebook so she can practice on her own. It was a fun lesson with Linda and Benji, and visiting Beatrice too.